A local firefighter who knew the risks about fireworks still became a statistic. Now, he wants his story to be an important safety lesson. It's that time of year for picnics and fireworks, but it's also that time of year of serious injuries. And a local firefighter who knew the risks still became a statistic. Now, he wants his story to be an important safety lesson. Jason (Jay) Northup's been a firefighter nearly 25 years and currently is a Captain for Euclid’s Fire Department. So let's get this out of the way first: “Yeah I should have known better, but the fact remains I almost killed myself and it was never something I intended on doing,” he says. Like hundreds of other people, Jay bought fireworks for a backyard display two years ago but when one box seemed to have a dud, he waited ten minutes and went to check. “What I did not realize because it was dark out what that this side of my face was right over top of one of the tubes. As I pealed the paper that was enough air that it went off and it just so happens the only one that went off was the one my face was over,” he says. 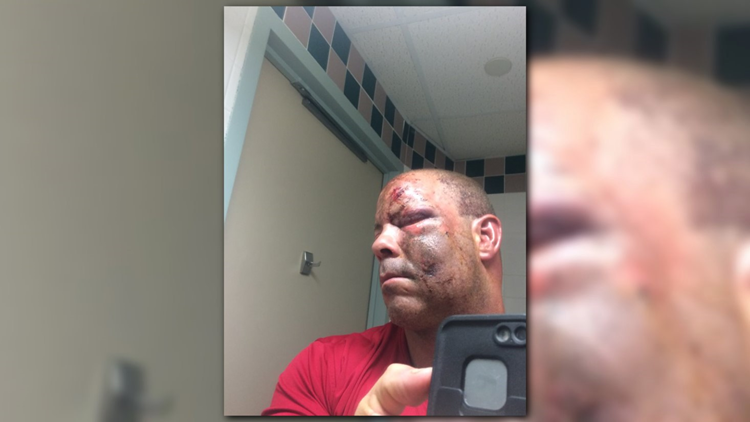 The explosion ruptured his ear drums, sent debris into his eyes, burned his face, gave him a concussion and a brain bleed that could have killed him. He needed 35 stitches on his head where you can still see powder embedded in his skin but the worst damage was to his right eye. “They actually thought I was going to lose my eye,” he says. “He's lucky he's alive,” says MetroHealth Opthalmologist, Dr. Thomas Steinemann. He’s no stranger to cases like this. “Fireworks this time of year, I'm taking care of somebody right now,” Dr. Steinemann says. Jay had a traumatic cataract and needed surgery to replace his lens and save his vision and while his scars may have faded, he still has nerve damage in his eye. The explosion paralyzed his pupil so his pupil doesn't move anymore which makes him very light sensitive. “It can happen to anybody, it really can, and if I can keep somebody from making the same mistake it's most certainly worth every bit of embarrassment or criticism I get from the general public about how I should have known better,” Jay says.